Holding their last practice session before being forced to go on a break by the BCCI, India's bowling coach Joe Dawes and fielding consultant Trevor Penney made the players 'sweat' before the one-off practice game ahead of the five-match ODI series starting August 25. Looking to pick up the pieces from the embarrassing 3-1 Test loss against England, the visitors now await the new coaching staff before their 50-over warm-up match against Middlesex at the Lord's. Skipper Mahendra Singh Dhoni, Shikhar Dhawan, Rohit Sharma, Virat Kohli, Ravichandran Ashwin, Ravindra Jadeja and Mohammad Shami, took the day off after attending the nets. The net sessions and the way they were carried out seemed to give an impression that Dhoni may miss the Middlesex game and rather choose to sit with the think-tank to try and chalk out a winning strategy for the one-dayers and the one-off Twenty20. In the mean time, Dawes and Penney took Team India through their paces in the net session with some slip-fielding practice and throw-downs taking place as the bowlers and batsmen did their respective drills. 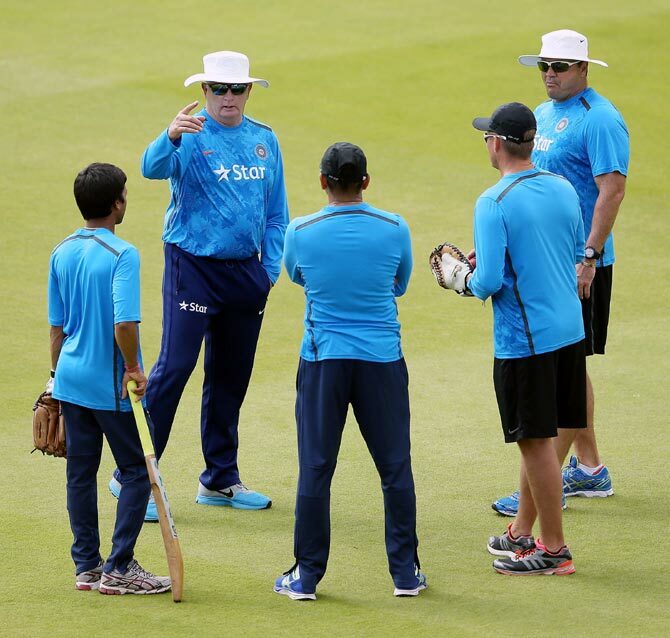 Newly-appointed assistant coaches Sanjay Bangar, Bharat Arun and fielding coach R Sridhar will look to bring some change to India's fortunes with Team Director Ravi Shastri clarifying that the new team will not try to clip under-fire coach Duncan Fletcher's wings. Though only three players from the Test contingent, Ajinkya Rahane, Bhuvneshwar Kumar and Stuart Binny, made it to the practice session at the Lord's nursery grounds, the young brigade went about the drills diligently. Looking to get into their limited-overs groove before the Bristol ODI on Monday, the Indian players are not only looking for a change in fortune but are keen to prove their detractors wrong, atleast in white-ball cricket. Though the team has still not talked about the one-day combination it has in mind, but Sanju Samson was seen practicing his wicket-keeping skills along with an intended slip-cordon of Binny, Rahane and Suresh Raina. The methods of Fletcher have also come under intense scrutiny and the Zimbabwean is not known to treat practice games with intensity. Many felt that India took the two warm-up games -- against Leicestershire and Derbyshire -- before the Tests too lightly and their lackadaisical approach did not help the team at all. The onus of this practice session, apart from a new slip cordon, was perhaps to test out the various contenders for the middle order as well. As things stand, Rohit, Dhawan, Kohli and Dhoni are a shoe-in to be in the playing eleven for the first ODI. Ashwin and Jadeja are expected to bring up the lower order. But the Indian middle-order in the ODI format was found to be shaky in both South Africa and New Zealand. With this thought in mind, Rahane, Binny, Ambati Rayudu, Samson, Raina and even Karn Sharma had a decidedly long hit in the nets. This practice game assumes larger significance for these players, especially Samson and Sharma, for they wouldn't want to be on the fringes after being afforded a huge opportunity. It was interesting to see Bhuvneshwar Kumar work out in the nets as well. Maybe he has rested enough after being the team’s workhorse during the five-Test series. With preparations for the ODI World Cup expected to take swing now, Kumar was not given rest from this ODI series. It remains to be seen whether this was a good move or will it further hamper his fitness ahead of a long cricket season coming ahead. 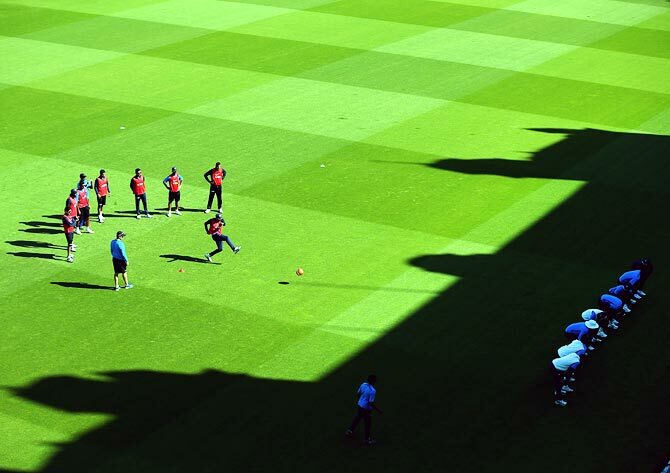 At Leicester and Derby both, the home teams had laid out the red carpet for the visiting Indian side and given the option of choosing how they wanted to play those two practice games. It remains to be seen if Middlesex will be as kind for Lord's does not host the Indian team for an ODI this summer and the hosts might want a serious game of cricket. Should BCCI ban wives and girlfriends on tours? Numbers game: Kohli's showing third worst by an Indian at No 4!